We offer numerous storm door styles to enable you to match the unique personality of your home. Jasco storm doors are produced by using aluminum extrusions that are up to 20% thicker than the industry standard. Our doors are built to last a lifetime. Popular styles include Dual Provincial, Four Square, Colonial, Hi-Low, 900 One Lite, 15 Lite Jalousie, Cross Buck, 1003 Country, Half Self Storing, 1001 Full View, Equal Lite, Half Jalousie, and more. Hollow frame in 3" heavy gauge aluminum for added strength. Safety-glazed with either 1/8" tempered glass or clear acrylic. Fiberglass screening with durable vinyl coating. All screws are either stainless steel or aluminum. Electrostatically applied acrylic in your choice of gleaming white or rich brown. Double kickplates strengthened and insulated with light weight polystyrene insulation board. 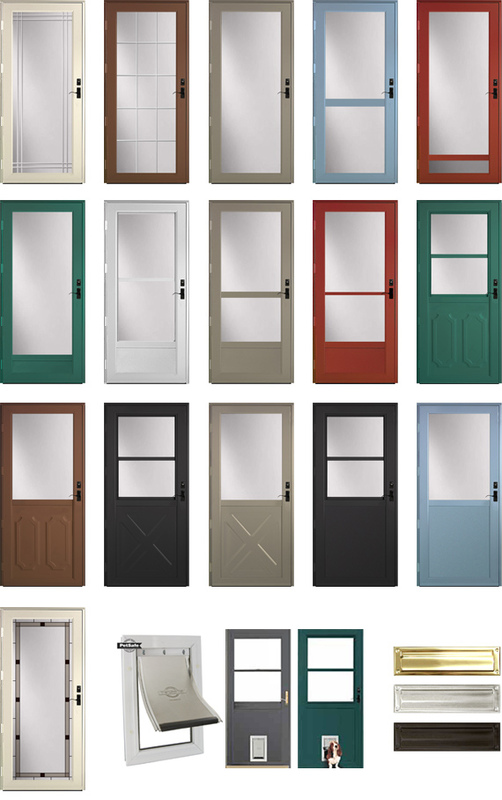 Jasco manufacturers our own high quality storm doors. Other reputable brands like ProVia are also available upon request. To get a quote or more information about Storm Doors, especially for homeowners and contractors in the Long Island, NY area, please contact us or use the easy form in the right column. We look forward to helping you turn your project plans into a reality.